The Bangor Daily News published a very informative article about Mesothelioma, the cancer caused by exposure to asbestos. No business can afford to ignore potential asbestos exposure. A hotel in England has been fined £200,000 for exposing workers and guests to deadly asbestos fibers. The San Francisco Chronicle reported that the Illinois Environmental Protection Agency is asking courts to halt a demolition project due to high levels of asbestos contamination. The Oregon OSHA Department has cited the Police Activities League of Greater Portland for health violations including asbestos in restrooms. We spent a lot of time this week Reth!nking Facility Management and one thing to think about is definitely managing asbestos. Today's Facility Manager's online magazine agrees in this article: Should Facility Managers Be Concerned About Asbestos? The answer is YES! Next week we will be going back to our other topics: mold, bed bugs, dust mites and other environmental issues. But asbestos is a continuing problem and will not go away any time soon. 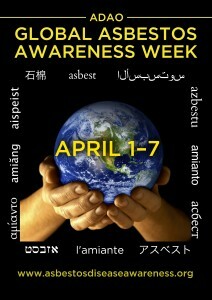 Watch our Facebook Page and our Twitter Feed for more information about asbestos and other environmental challenges.